Exhausted – 1, 2, 3, SCD! So, the last two months went by pretty fast. No doctor’s appointments, particularly aggravating Crohn’s moments, or anything I really remember feeling bad about because they went unshared to all of my, like, seven readers. There are always those nice moments, though, like discovering a new recipe or finding out someone else you know has IBD, too, and then realizing that of course they don’t do the diet because pretty much no one does. Oh well. Normal two months, not too much drama, not nearly as depressing as September and October were last year. On Halloween, my friends and I went trick-or-treating, and I earned a total of 400 pieces of candy (most of which consisted of the stuff nobody else was going to actually eat, like Whoppers or whatever), which translates to $100 (!!!) in my pocket. Ka-Ching. But, just before my success on that front, I had started to have stomach aches again. I haven’t been lucky enough to feel totally normal since a couple of days before Halloween. I got worried, so last week I got some blood taken to make sure that I wasn’t getting sick. Everything was still normal. I have to admit, after a year of eating the way I do, I honestly think I just got a little bit cocky. I piled up on dried fruit, honey (lots of even natural sugar isn’t great for me), food that I wasn’t 100% sure was allowed, etc. I could have done better. So, moral of the story: even if you’re clinically in remission, don’t slack off. I’m working on it. As a normal American 13-year-old in 2017, my greatest weakness is my phone. It distracts me, mostly from getting to sleep on time every night. As a normal American 13-year-old in 2017, I wake up at 6:30AM to my alarm, which just so happens to be “Wake Me Up Before You Go-Go” by Wham! (okay, maybe not a totally normal American 13-year-old). As a normal American 13-year-old in 2017, I don’t get the right amount of sleep, like, ever. As a girl with a chronic illness, I’m supposed to get even more sleep than most people my age, which I kind of never do. 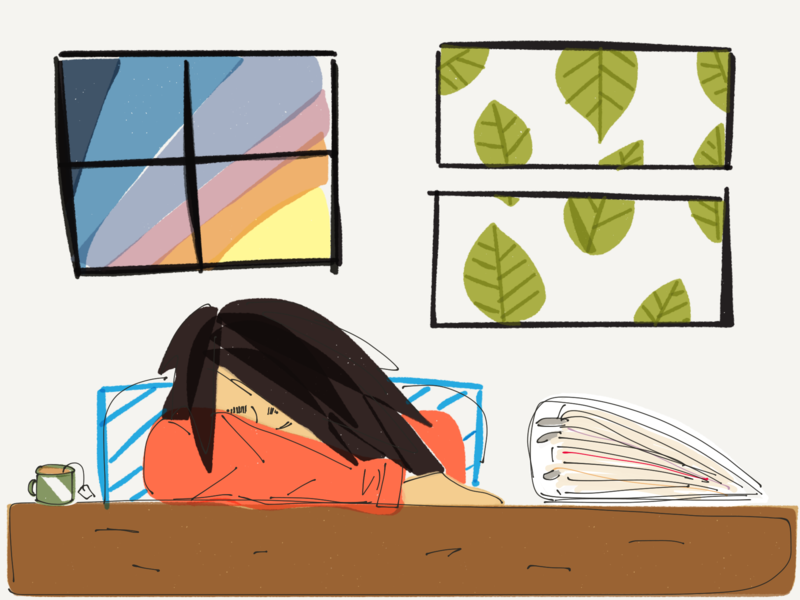 So tired, I started doodling self-portraits of me lying down on my desk all throughout school today just to keep myself awake (and eventually making the finished product on my Paper app, seen above). So tired, I had to make my alarm freaking “Wake Me Up Before You Go-Go”. Anyway, like I said, I’m working on it. And that was my update for the last two months. I promise, next time it will be a recipe. Getting up that early is the worst! I don’t know any teenager who likes it. And at least one old lady (moi) who just can’t. Never could! Stay healthy! SCD legal pumpkin pie coming your way in just 10 days!